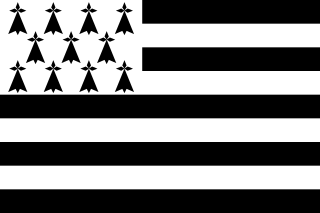 Brittany is one of the 18 regions of France. It is named after the historic and geographic region of Brittany, of which it constitutes 80%. The capital is Rennes. Bathed by the English Channel to the north and the Bay of Biscay to the south, it is located in the West of France, bordering the Normandy and Pays de la Loire regions. 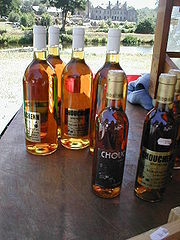 Bro Gozh ma Zadoù is the anthem of Brittany. It is sung to the same tune as that of the national anthem of Wales, Hen Wlad Fy Nhadau, and has similar words. As a region of France, Brittany has a Regional Council, which was most recently elected in 2015. Côtes-d'Armor, formerly known as Côtes-du-Nord, is a department in the north of Brittany, in northwestern France. A Fest Noz is a Breton traditional festival, with dancing in groups and live musicians playing acoustic instruments. The bombard is a contemporary conical-bore double-reed instrument widely used to play traditional Breton music. The bombard is a woodwind instrument, and a member of the shawm family. Like most shawms, it has a broad and very powerful sound, vaguely resembling a trumpet. It is played as other shawms are played, with the double reed placed between the lips. The second octave is 'over-blown'; achieved via increased lip and air pressure or through the use of an octave key. It plays a diatonic scale of up to two octaves, although contemporary instruments frequently have added keywork permitting some degree of chromaticism. A bombard player is known as a talabarder after 'talabard', the older Breton name for the bombard. Breton dance is a group of traditional dance forms originating in Brittany, the Celtic region of France. The dance has experienced a reappropriation in the late 1950s, with the development of the Celtic Circles and Fest Noz. Les Ramoneurs de menhirs is a Breton celtic punk group formed in 2006. Its members include Éric Gorce on the bombardon, Richard Bévillon on the bagpipes, the traditional vannetais singer Gwenaël Kere and Loran, guitarist from the group Bérurier Noir. They play concerts at fest noz as well as normal rock concerts. 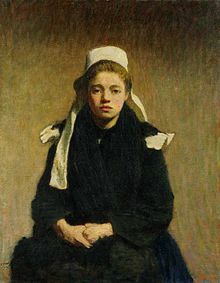 Most of their songs are sung in Breton. The Festival de Cornouaille is an annual festival taking place in the city of Quimper, located in the south-west of Brittany (France) in July. The festival has been held since 1923 and is one of the biggest cultural events in Brittany. 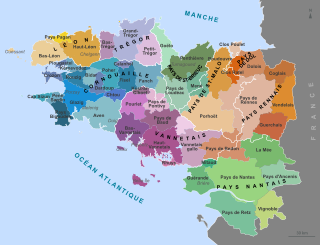 The language boundary in Brittany is the language border between the part of Brittany where Breton is spoken and the area in Brittany where Gallo is spoken. 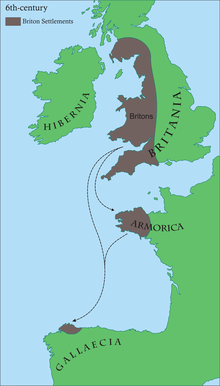 The existence of this linguistic border led to differentiate the Celtic-speaking Lower Brittany (West) from the Romance-speaking Upper Brittany (East).